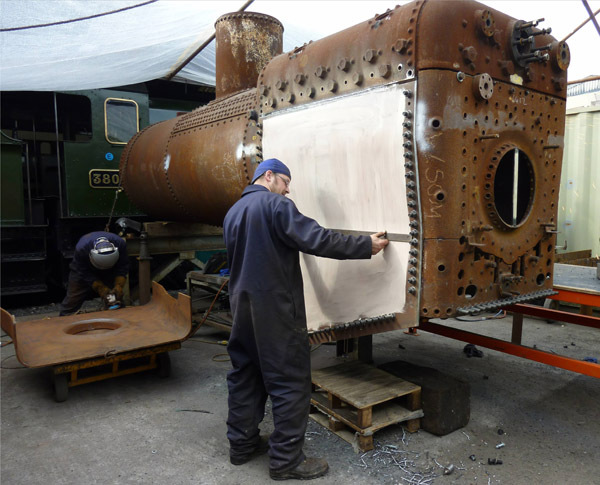 With the completion of the purchase of RK Pridham Engineering, the transfer to Buckfastleigh of all the machinery, equipment and the skilled staff, the first job allocated to the new team is to make a start on the overhaul of the boiler for 6412, pending the completion of the new boiler works. This locomotive is an ideal size for the Ashburton Branch which is why the former branch owners, the Dart Valley Railway, had three (6412, 6430 and 6435 though 6430 was for spares). The Dart Valley Railway sold 6412 to the West Somerset Railway in the 1970's and it was purchased from them by the SDR a year or so ago (see 6412's page). The boiler had been stripped for inspection and it was known to be in need of major plate replacement so what better challenge for the boys from Pridham's! 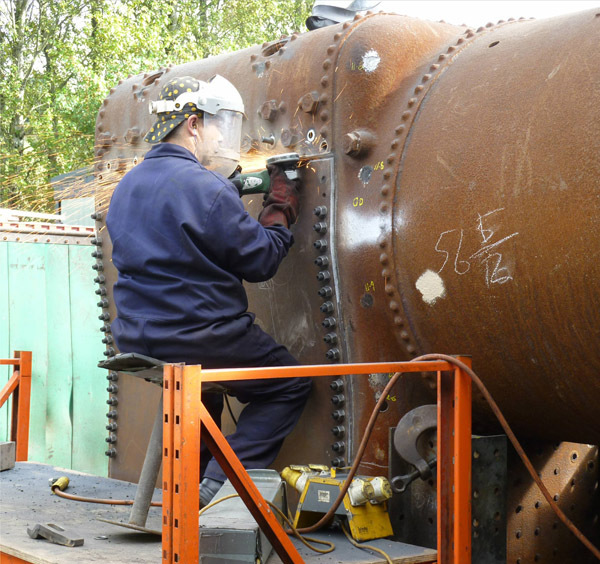 The pictures show two of the new outer firebox plates already bolted in place - rivetting comes later. On the ground is the new pressing for the backhead, which had already been formed at the Pridham's Tavistock works.